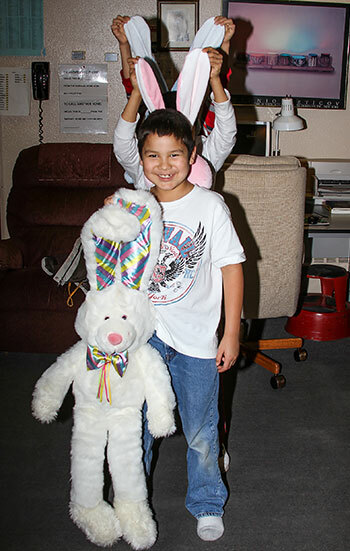 What is Easter like at Cheyenne River Indian Outreach? I am thankful for my food and everyone else’s, because we are very lucky to get fed good and have food every day without worry. We do everything we can to give the children at our Child Services Center the simple pleasures of the Easter holiday, like decorating, the fun of dying Easter eggs and even a few treats! Winter on the South Dakota prairie is cold and windy. Spring can be unpredictable, with blizzards possible in March and even April … But, we are grateful for temperatures above freezing and seeing the sun a little longer each day. As spring approaches, we love to spend time with students taking walks and enjoying the fresh air. Everything we do gives the children at our Child Services Center the simple pleasures of the holiday, like decorating, dying Easter eggs and a delicious holiday feast. At our Child Services Center, we help children ages 10-17 from the Cheyenne River Indian Reservation who have been abused and/or neglected. They are placed in our care because there’s no other safe place for them. Our highly qualified team helps youth (primarily Native American, but we don’t discriminate based on heritage) heal physically, emotionally and mentally. Students in our program learn to develop balanced, healthy lives through strategically developed activities. Thanks to your generosity, they are provided so much more than just a safe place! Learn more about the services offered for at-risk youth to help turn their lives around.